Looking for that perfect cup of coffee? The Kibaga reusable coffee dripper will get you a step closer! Create your very own pour over coffee and experience how good coffee can taste! 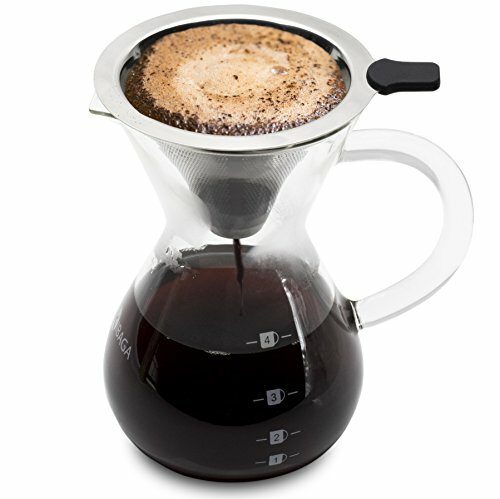 The special food-grade stainless steel filter design prevents the coffee dripper from clogging up and ensures that all nutrients and flavored oils seep right into the elegant 14 Oz glass carafe - creating a delicious, well-balanced coffee! A heat-resistant black handle makes it easy to hold the stainless steel pour over coffee dripper and avoids burned fingers. Only premium materials such as top-quality stainless steel mesh for the pour-over brewer and robust borosilicate glass for the carafe have been used, offering you a fabulous coffee brewing set. Enjoy a superior coffee experience without using any extra paper filters - save money and the environment! You don't need any magic skills to brew the perfect coffee. Allow yourself the time to find YOUR ultimate brewing style by trial and error. And since the pour over coffee maker (4" outer diameter) can brew up to 3 cups in one go, you can ask your loved ones to have a taste, too. Grab your pour over coffee mug, take a sip and close your eyes - tastes like heaven! Tip: using a coarse grind is recommended, as it filters through the stainless steel filter better than a super fine grind. Order your Kibaga coffee dripper set today and add a true barista-like gem to your kitchen! If you have any questions about this product by KIBAGA, contact us by completing and submitting the form below. If you are looking for a specif part number, please include it with your message.